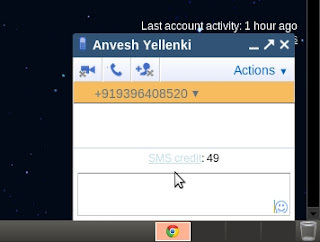 In the dialog box, enter a phone number in the ‘Send SMS messages to this number’ field. This feature is only launched in selected countries. If you are not located in one of these countries you can still use it, but you won't see the SMS option in Chat until you enable it manually in the Chat settings page. SEE ALSO: PINTEREST-NEW WAY OF SEARCHING. If your contact replies, the text message response will appear as a reply in Chat. These conversations are stored in your Chat history just like regular chats (but keep in mind that you can’t go off the record while communicating via SMS). SMS charges: Google does not charge for using this service. However, mobile providers' standard charges will apply to any SMS messages sent from a mobile device to Google Chat.